Hey guys! Here is a list of 15 easy dinners that are keto friendly, low carb, dairy-free, gluten-free, and paleo. These bad boys are sure to give your tastebuds a ride of their life. No more fears for those keto beginners out there — try any number of these new recipes and let me know what ya think. It's no secret that the ketogenic diet is here to stay the momentous popularity of this diet has jump drastically from the benefits people are gaining this high-fat low-carb and moderate protein diet offers a number of different benefits but it's not to be mistaken with a low-carb diet there's a drastic difference, that being ketosis. Now, if you're like me, I always assumed low carb and keto diets were the same thing. however, the one main difference is being in a ketogenic state. Reminder standing, when your body is deprived of its first favorite fuel source (carbs AKA glucose) hey, fats. Once your metabolism begins to use body fat as fuel, you entered a state of ketosis. Whereas simply trying a low-carb diet may not deprive your body of enough in order to efficiently alter its metabolic state. I know the first starting out on the keto diet can be very overwhelming and people often wonder what can I eat on a keto diet? This blog post covers what to eat on the keto diet keto recipes that are perfect for weight loss and could even be added into a keto meal plan perfect for cutting into your keto macros. don't know your macronutrients? Use a keto macrocalculator to figure those out! Boom. your macronutrients? Use a keto macro calculator to figure those out! With that being said, I've gathered a list of my top favorite dinner recipes that are keto friendly recipes, low carb, gluten-free, dairy-free and paleo. in fact these keto recipes fit perfectly within any keto meal plan as they are all lacking any serious carb count. In no particular order, I'm starting this list off with some delicious keto salmon to go with any side dish. This recipe is from hey keto mama. salmon is one of the first meals that come to mind when I think of a healthy dinner dish filled with healthy fats, low carb and moderate protein intake. The best part about salmon is that you can flavor it and season it however you want. some people find seafood intimidating to cook however this recipe is straightforward and is pretty much hard to mess up. For this recipe Hey Keto Mama mentions that you'll need to five ounce pouches of pink salmon, you can use cans or pouches. You also need one egg 1 quarter cup of finely ground pork rinds 2 tablespoons of finely diced red onion and then your choice of half of a jalapeno finely chopped or you can leave that out if you prefer no spice. The instructions for this recipe call for a large mixing bowl where you'll mix in the salmon egg Red Onion ground pork rinds and any additional seasonings and then form the patties with the mixture. This should create or large Patties or five to six small ones. in a nonstick skillet drizzle some non-stick oil or spray and cook the patties over medium heat for 4 to 5 minutes or until each side is golden brown and crispy. And just like that, you're done! 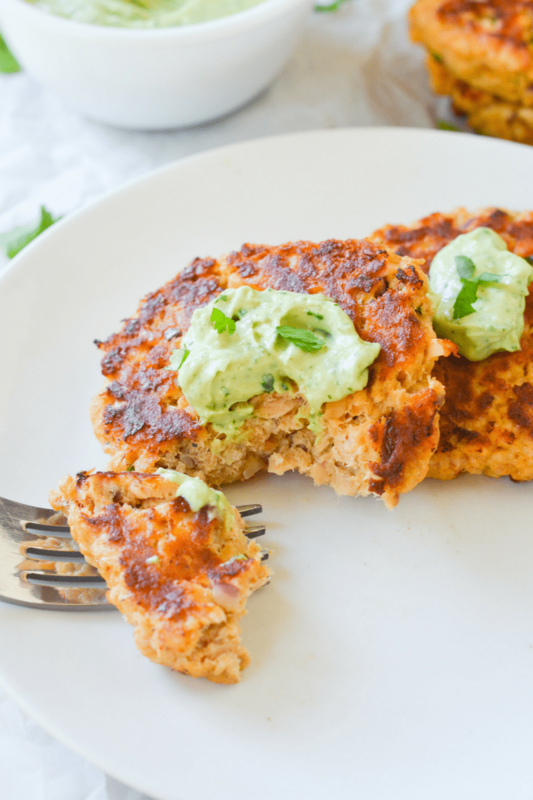 these salmon cakes what are the perfect addition to any keto meal plan, especially when you're on the go. These chicken enchilada bowls are another easy keto dinner recipe for beginners by hey keto mama. for this recipe they recommend two tablespoons of coconut oil, one pound of boneless skinless chicken thighs, three-quarters of a cup of red enchilada sauce, A quarter cup of water, a quarter cup of chopped onion, and 1/4 oz can of diced green chiles. For the instructions you'll need a pot or a dutch oven. In the pot or Dutch oven place it over medium heat and melt the coconut oil. Ones hot, sear the chicken thighs in the coconut oil in the pot until they are lightly brown. Pour in the enchilada sauce and water and then adding the onions and green chilies. reduce the Heat and cover. y'all want to cook the chicken for anywhere from 17 to 25 minutes it's or until the chicken is fully cooked and at least 165 degrees internally. Once it's at the internal temperature mentioned above, carefully remove the chicken thighs and place them on to a work surface like a cutting board. Chopper Shred the chicken and add it back into the pot. Love the chicken Semoran cover for another 10 minutes to absorb flavor. Once this is done you can pretty much customize the way you serve the chicken to your preference whether it be with avocado sour cream or any other number of keto friendly side servings. First of all, bacon wrapped anything is amazing. and wholesome yum really knocked this one out of the park. if these keto meals don't make you fall in love with this diet within themselves, then I can't help you. wholesome yum mentions you'll only need three ingredients for this recipe. Making it the perfect dinner recipe for beginners on the keto diet. you'll need one pound of chicken breast tenderloins or about 8 pieces, 8 slices of bacon, and four slices of cheddar cheese that will end up being cut in half. The instructions for this keto recipe are fairly simple. Fill a large bowl with warm water and a couple tablespoons of sea salt. Add the chicken breast tenderloins and make sure the water covers them. Set them aside to brine for at least 10 minutes. Next you'll want to preheat the oven to 450 degrees Fahrenheit and a line a baking sheet with parchment paper to get it prepared for the chicken. Next, remove the chicken from the water and patted dry. Place a piece of cheese over each piece of chicken. Wrap the two together in a slice of bacon. And place the Chicken on the baking sheet with the cheese side facing up repeat this step with the remaining chicken, cheese and bacon. You can do what I did and make this recipe dairy-free by removing the cheese step and only using chicken and bacon. once everything is on the pan and ready to go place it in the oven at to bake for about 13 to 16 minutes or until the chicken is cooked through. To finish off the bacon and make it nice and crispy place it under the broiler for a couple of minutes. And me and how more delicious can you get? These are two of my favorite things, the instant pot and pulled pork, yum! A saucy kitchen did an awesome job with this recipe. I personally think the instant pot is a great tool to use especially for beginners new to keto looking for simple dinner recipes to try. Sarah from A Saucy kitchen recommend you get one medium onion cut into quarters, 2 tablespoons of dried oregano, 2 tablespoons of lime juice, 3 tablespoons of oil, but the main star of the show would be the 4 lb of pork shoulder. you can trim the excess fat off of it to make it a little bit later if you prefer. but who doesn't love the fat? With an instant pot instructions are always pretty self-explanatory. simply add the garlic onion seasoning oil do a food processor blender until you have a thick piece. there's a chance that the 4 lb of pork shoulder are too big to fit inside your instant pot or pressure cooker, if this is the case, cut it in half or until smaller pieces we'll fit in. Rub the marinade or the thick paste all over the pork. Cover the pot and let it marinate in the refrigerator for 30 minutes to 24 hours. When you're finally ready to cook it, other remaining tablespoon of oil to the bottom of the instant pot. Add in the pork shoulder. If you still got skin on the pork, make sure you place it down with the skin up. Close the lid and make sure the valves in a sealed position and press manual and set the pressure cooker on high for 60 minutes. Thinking you can't have pizza without the carbs? Thanks again. This Keto Fathead pizza crust by wholesome yum is the perfect substitute for traditional pizza. for this pizza, you only need for ingredients, a cup and a half of mozzarella cheese shredded, 2 tablespoons of cream cheese cut into cubes, two large eggs, and 1/3 a cup of coconut flour. Like any pizza you'll have to preheat the oven pretty high to 425 degrees Fahrenheit wholesome yum recommends lining a baking sheet or pizza pan with parchment paper. They ask you to combine the shredded mozzarella and Cubed cream cheese and a large bowl. Microwave These two ingredients in the ball for 90 seconds during halfway through. Stir in the beaten eggs and soap turn up. Knead with your hands until the dough forms. next, spread the dough onto the line facing sheet to 1/3 inch thickness using your hands or a rolling pin over a piece of parchment paper. Use a toothpick or 4th to poke lots of holes through the crust to prevent bubbling. Finally, bake the dough for 6 minutes. Poke more holes in any spots where you see bubbles forming. Bake for another 5 minutes or so until the crust is a golden brown. I don't know about you but stir fry is one of my favorite things to make. Mainly because you can do a number of different things with it including making a variety of different keto friendly dinner recipes that are perfect for beginners following the keto diet. Skinny taste recommends the ingredients for this recipe to include one and a half pounds of skinless chicken breast, cut into 1-inch cubes. This recipe also includes a half a cup of reduced-sodium chicken broth, 2 tablespoons of reduced-sodium soy sauce or coconut aminos for gluten-free and Whole 30 approved ingredients, two teaspoons of arrowroot powder or tapioca starch, 2 tablespoons of water, 1 tablespoon of avocado oil, 1 bunch of asparagus, with the ends trimmed and cut into 2-inch pieces, six cloves of chopped garlic, 1 tablespoon of fresh ginger, 3 tablespoons of fresh lemon juice, and fresh black pepper. The instructions for the Skinny Taste recipe start off by lightly seasoning the chicken with salt. Then, in a small bowl, combine chicken broth and the soy sauce or aminos. And a second small bowl, combine the tapioca starch and water and mix well. Heat a large non-stick Wok pan over medium to high heat, when it's finally hot add 1 teaspoon of the oil and add the asparagus. Cook until the asparagus is crispy about 3 to 4 minutes. Next, add the garlic and ginger and cook until golden, about 1 minute. Set aside. increase the heat to high, then add 1 teaspoon of oil and half of the chicken and cook until the chicken is brown and pick through, that should take about 4 minutes on each side of the chicken. repeat this with the remaining oil and chicken set aside. you'll want to add in this way sauce mixture and bring it to a boil to cook about a minute to a minute and a half. Next and final step is to add lemon juice and cornstarch mixture and stir well and when it simmers, return the chicken and asparagus to the walk and mix well, finally remove from the heat and serve. For these Apple pork chops with bacon by ketoconnect, you'll need 16 oz of pork loin chops boneless or two 8 oz pork loins. You also need a half a cup of apple cider vinegar, 2 tablespoons of grass fed butter, 1 tablespoon of ghee, one slice of bacon chopped, one sixth of medium white onion minced, 1 inch of Ginger grated, 1 teaspoon of ground cinnamon and 35 drops of liquid stevia. The instructions for these pork chops start by using the pork chops with salt and pepper and patting them dry. Heat a pan to medium-high heat. Once the pan is hot add in the pork chops. After 3 minutes, flip them and allow them to continue this year for another 3 minutes. Flip the chops onto their side if there is a strip of that to crisp it up. Place the pork chops in a 400 degree oven for 15-20 minutes. Once they are cooked set them aside to rest. This is when the fun starts. Place the pan that has all the drippings back onto the stove top and scrape up the drippings on medium to high heat add one slice of bacon and allowed to cook almost fully. Then add the onion Ginger and cook that on a lower heat for a couple of minutes. Next, add half a cup of apple cider vinegar to the pan along with the stevia and cinnamon. Cook this until you get a sticky, thanks off. Then add 2 tablespoons of grass fed butter and allow the sauce to cook for an additional 1 to 2 minutes. Then these bad boy chops are ready to serve with the glistening sauce on top. Aw hell yeah. Real talk. You know I love my fam at Perfect Keto. Hey guys! For this easy chicken cauliflower fried rice you'll need half a teaspoon of sesame oil, 1 tablespoon of avocado oil, 1 small finely sliced onion, one carrot chopped, half a cup of red peppers finally sliced, half a cup of snap peas chopped, one tablespoon of finely chopped garlic salt, pepper, 2 teaspoons of garlic powder, 4 cups of rice cauliflower, four chicken breasts that are cooked in chopped, 1/4 cup of coconut aminos, and two large scrambled eggs. To start off this recipe, lightly seasoned the chicken breast with top a teaspoon of salt and 1/4 teaspoon pepper and 1/2 a tablespoon of olive oil. Begin cooking the chicken on a grill pan or pan of your choice. Eat a large Wok or pan under medium to high heat. Add sesame oil and remaining coconut or avocado oil. Saute the onions and carrots together for 2 to 3 minutes. Then, you'll add the remaining vegetables seasonings and then will cook it for an additional 2 to 3 minutes or until it's tender. Don't want to add the fresh garlic riced cauliflower and soy sauce or coconut aminos. Stir that well. Add chicken and scrambled eggs. Mix until well combined. Turn off the heat and stir in the green beans. Re-season the mix to taste and then top off with sesame seeds if you’d like. Freaking so good my dudes. Okay. I need a minute with these meatballs. They are too freaking good. If this list was prioritized by my favorite keto friendly recipes AND easiest keto friendly recipes for beginners, these meatballs would be the winner. And this recipe is done by Perfect Keto as well. Because duh. The ingredients that perfect keto recommends for this recipe include one pound of grass-fed ground beef, 1 large egg, 1/2 a cup of grated Parmesan, half a cup of shredded mozzarella, 1 tablespoon of minced garlic, 1 teaspoon of black pepper, and a half a teaspoon of salt. You can easily make this recipe dairy-free by simply taking out the cheese. Boom. Done. Start the instructions start by preheating the oven to 400 degrees Fahrenheit. Line a baking sheet with parchment paper. In a mixing bowl, use your hands and combine all the ingredients and need them together until well Incorporated. Form the mixture and two equal sized meatballs with your hands and place on a prepared baking sheet. For 18 to 20 minutes. Allow them to cool slightly and then serve them warm. Whether you’re keto or not, these stuffed bell peppers are the perfect addition to any dinner or keto meal prep or meal planning you’re considering. I mean really, what’s easier to take on the go than a stuffed bell pepper? Just put that thing in a tupper ware and heat it up whenever you want! 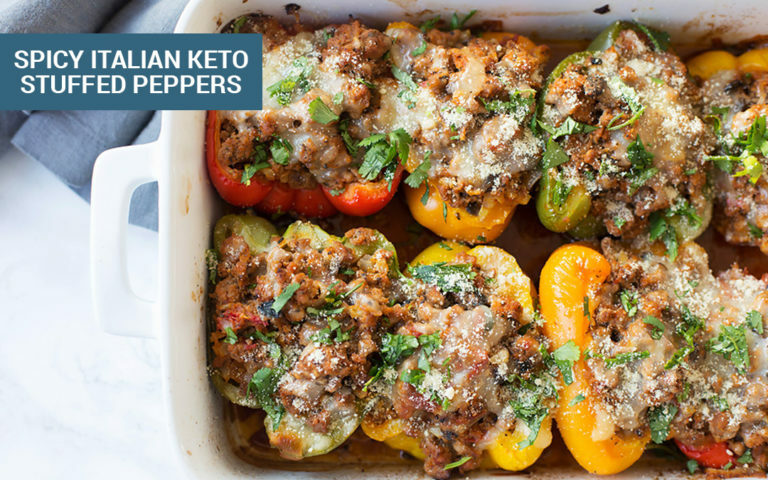 The ingredients for these Spicy Italian Keto Stuffed Bell Peppers by Perfect Keto include One tablespoon of olive oil, 1 pound of spicy Italian style ground sausage, one small onion finely chopped, one cup of roughly chopped mushrooms, one cup of rice cauliflower, salt, pepper, 2 tablespoons of tomato paste, Half a cup of Parmesan cheese 1 cup of mozzarella cheese, three large bell peppers split in half, a quarter cup of fresh basil and a half a cup of chicken broth. You'll want to preheat your oven to 350 degrees Fahrenheit. Add olive oil to a large pan and set to medium heat. Brown the Italian sausage for 3 to 4 minutes. Add onions, mushrooms, riced cauliflower, salt, pepper, and Italian seasoning until vegetables are mostly tender, this will take about 5 minutes. Next, you'll add the tomato paste and chicken broth. Mix the swell and continue to stir. Simmer this feeling for about 10 minutes under low to medium Heat if you're not trying to keep this recipe dairy free then you can add in the parmesan cheese at this point. The last step is to slice the peppers in half lengthwise. Then simply scoop in the filling from the pan and top with cheese, garnish or whichever other toppings you prefer. Bake for 20-25 minutes until the tops are golden brown. Enjoy and let me know what ya think! Preheat oven to 400 degrees. Spread parchment paper on top of sheet pan. Cut spaghetti squash either way down the middle. Drizzle olive oil, salt and pepper on spaghetti squash. Put on pan and place in oven for 40 minutes. Once the spaghetti squash is baked, pull out and allow to cool. Scrape the squash out with a fork in a bowl. 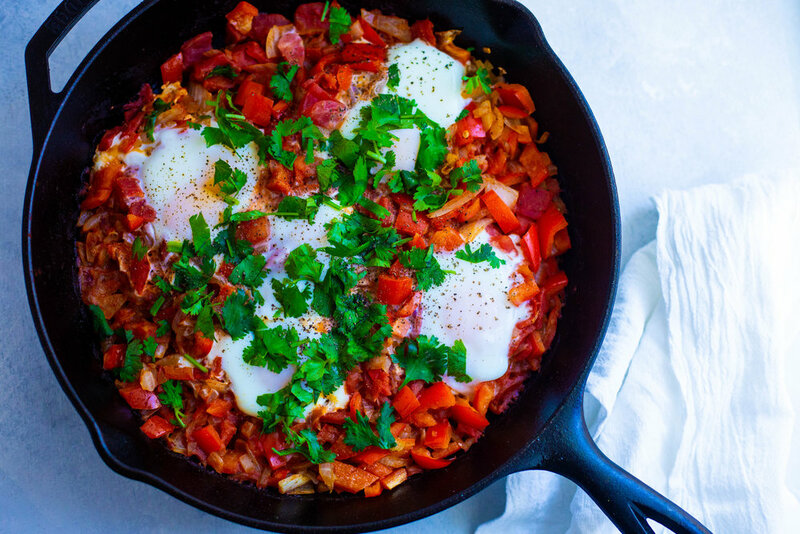 The healthy foodie really knocked it out of the park with this one. I mean, even if you aren't following a ketogenic diet, who doesn't love a nice steak? These Brave sirloin steaks are easily customizable simply by all the different spices and mixes you can add to them. For the ingredients of these particular steaks healthy foodie recommends six 8 to 10 oz top sirloin steaks with them being trimmed of the visible fat. You'll also need two large onions that are sliced, to bay leaves, and 3 cups of water. You should try to take advantage of grilling season while you still can. Preheat your outdoor grill to really high heat (about 600) and your oven to 350 degrees Fahrenheit. Grind all the spices together however you wish. Place your steaks on a cutting board and sprinkle then with the spice mixture. Place the steaks on the Hot Grill and cook them for about 10 minutes per side until they get nicely charred. While they're grilling scrape all the spices that didn't stick to the meat off The Cutting Board and throw them in a dutch oven at a tablespoon of ghee and melted over medium to low heat add the onions and cook them stirring them often. Next add two cups of water as well as the bay leaves. Turn off the heat and set the mix aside. When the steaks are done charring, place them in the Dutch oven on top of the onions then put the lid on and place in the oven to bake for 2 hours or until the meat is fork tender. For this salmon recipe by delish you'll need for 4 oz salmon fillets, one tablespoon of mustard, two cloves of garlic finely minced, 2 tablespoons of finely minced shallots, 2 teaspoons of fresh thyme leaves, 2 teaspoons of fresh chopped rosemary, juice of half of a lemon, freshly ground black pepper and lemon slices for serving. To recreate this recipe, start by hitting the broiler and line a baking sheet with parchment paper. And a small mixing bowl, add together the mustard, garlic, shallots, thyme, Rosemary, and lemon juice and season that with salt and pepper. Spread the mixture all over the salmon fillets and broil them for 7 8 minutes. Top them off with some thyme and lemon slices and boom. Done.